I find that hot water pastry is the best to use for savoury pies - it's very quick and easy to make, and very robust. Heat the water in a saucepan, and add the lard. The idea is to melt the lard in the water, but you don't want it to boil. In a bowl, stir the salt into the flour, then stir in half of the lard/water mixture. When this is incorporated, add the remaining liquid and stir until it comes together as a dough. Wrap in plastic film and stick in the fridge to cool down. You don't want to chill it, but it needs to be cool enough to handle comfortably. First of all choose a pie dish and butter the inside of it generously. You'll need a biggish dish to accomodate all of the ingredients. The one I used has a capacity of about half a litre (about a pint). Sprinkle flour on your worktop and rolling pin. Divide your pastry into one third/two thirds. Roll out the smaller piece to a thickness of 3-4 mm (just under a quarter of an inch), and larger than the top of the pie dish - this will be your lid. Place the upturned dish onto the pastry and cut around the edge. Remove the dish and make 2 egg-yolk-sized holes in the pastry - I used a shot glass for this. Keep the discs you cut out, you'll need them later. Roll out the remaining pastry and place it over the top of the dish. Gently press the dough down into the dish, being careful not to break it or introduce any creases or folds. Use a spare bit of dough to press the pastry right down into the corners. Mushrooms contain a huge amount of water, so you need to get rid of this or it will make your pie soggy. Wash the mushrooms well and place them in a saucepan with the melted butter. Stir well to get them all coated, put a lid on the pan and cook for about 5 minutes, shaking the pan occasionally. When the liquid has been released, drain the mushrooms and set aside. Bacon is another water-hog, especially if you bought it from a supermarket. Place the rashers of bacon side-by-side on a piece of kitchen paper. Cover the top with more paper and pop it in the microwave for 2 minutes. Separate the bacon from the paper, pat it dry and set aside. Separate your eggs and place each egg white and egg yolk into an individual little bowl. Now we need to cook the egg whites, just enough so they are set. The best way to do this is to use a couple of well-greased metal rings (if you don't have any you could improvise by removing the top and bottom from something like a baked bean can, but be careful of sharp edges). Heat some oil in a frying pan and slide the egg white in. When it has cooked enough to move without it running, remove it from the pan. Finally, add a bit more oil to the frying pan and brown the sausages and the black pudding. Preheat your oven to 180°C (356°F) for a fan oven, 200°C (392°F) for a conventional one, gas 6. Take the pastry case in its dish. Place the rashers of bacon side-by-side (by the way, I've specified back bacon - if you can't get that you could use streaky, but the rashers will be narrower so you'll need more of them) in the bottom. Add a layer of beans, followed by a layer of mushrooms. Place the discs of black pudding on the mushrooms, then an egg white on the black pudding. Now it gets tricky - we still need to add the tomato and sausages. I had almost no space left so I had to insert the sausages vertically so they stuck out of the pie like chimneys. And I could only squeeze one quadrant of tomato in. You might have a bit more space available - good luck! Moisten the rim of the pastry case and place the lid over it. Squeeze the top and bottom together with your thumbs and do some fancy crimping if you like. If your sausages are sticking through the top, you might have a pastry upstand. Just cut it off. Place the 2 small pastry discs into the holes you cut them from, and paint the whole lid with eggwash. Pop the pie into the oven for about 30 minutes, then remove it. Remove the pastry discs and carefully slide an egg yolk into each of the holes. Put the pie back in the oven for another 3 minutes until the yolks are just cooked. The video above is from the Keef Cooks YouTube channel. 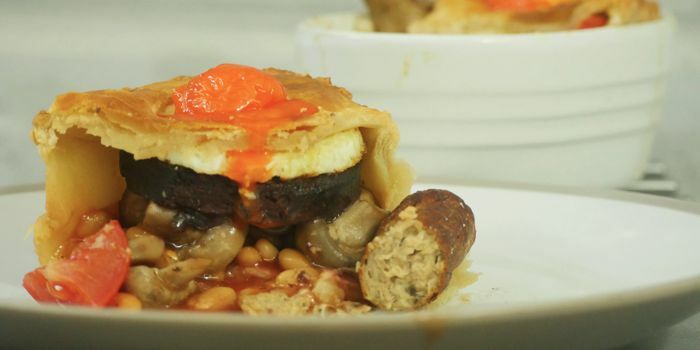 Click here to see the video recipe of English Breakfast Pie on YouTube. Oil for sautéeing. Egg wash (one egg beaten with a little milk) for glazing the pie. Total time: 1 hour 3 minutes.